There are six sheets of ice in the Curling Centre located adjacent to the RECplex lobby. The rink has hosted numerous successful bonspiels and as recently as 2009, hosted the Northern Men’s Tankard. There are lockers available for both men and women. There are ladies’, men’s and senior leagues as well as both Men’s and Women’s Super League. Bonspiels, both competitive and for fun, take place throughout the year and dates can be obtained by contact the Curling Centre at 306-873-4747. A lounge is also available directly above the curling lobby, and games can be watched from above. 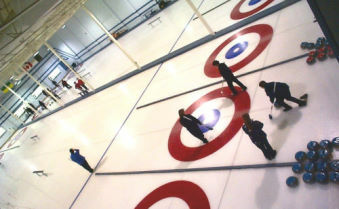 Curling season runs from October to mid March.